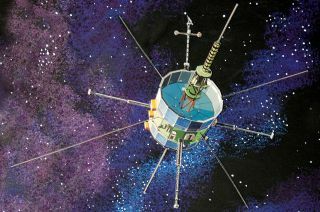 An artist's illustration depicts ISEE-3 (ICE) spacecraft. It will be a couple of additional weeks before a private group controlling a 36-year-old NASA spacecraft can maneuver the probe to a better orbit for communicating with Earth, the project's co-leader told Space.com today (June 13). The original plan was to turn on the engines of the International Sun-Earth Explorer 3 probe (ISEE-3) on Tuesday (June 17), but that step has now been delayed to sometime between June 30 and July 2. The June 17 date was "based on what we thought NASA was going to approve, and then things got in the way and it slipped through the paperwork," co-leader Keith Cowing told Space.com. Cowing added that the delayed engine firing shouldn't be a problem for fuel use, as long as controllers don't push the firing past mid-July. "We've needed less fuel than we thought, and moving it into this timeframe, it's okay." Cowing and Dennis Wingo are leading a group of enthusiasts, many of whom used to work on NASA missions, who received approval from the agency a few weeks ago to wake up and reuse the old spacecraft. ISEE-3 chased two comets, studied solar activity and monitored cosmic rays beyond our solar system after launching in 1978. But the probe had been retired since 1997, when NASA ceased communicating with the spacecraft after two decades of adventures. That changed in the past month when the ISEE-3 Reboot Projectraised more than $150,000 through crowdsourcing and signed a Space Act Agreement with NASA. Now the private group is talking almost daily with the spacecraft. They're mainly using the Arecibo Observatory in Puerto Rico, through a control center in an abandoned McDonald's near NASA's Ames Research Center in Moffett Field, California. Telemetry from the spacecraft shows that all of the probe's 13 instruments are turned on, but it's not yet clear how many of them are functioning. The magnetometer — an instrument that measures magnetic activity — may be working, Cowing said. "But that's not our priority right now," Cowing added. "Our priority is to assess the health of the spacecraft, range it and fire our engines." There's a slight possibility that the spacecraft could crash into the moon without an alteration in the vessel's trajectory. But after firing the engines, the group plans for the spacecraft to fly behind the moon in mid-August. Where it will go next remains an open question. It's possible the spacecraft could eventually park in a Lagrange point, a gravitationally stable location in space between two large objects (such as the Earth and the sun.) Or the craft could enter an elliptical or oval-shaped orbit near Earth. Using DSN will help the team figure out where to put ISEE-3, Cowing said. The spacecraft is spinning a little more slowly than it is supposed to for big maneuvers in space, so one of the first tasks will be to speed up the vessel's rotation rate. The team will then look at the data before doing the main engine firing, which will likely take place a day or two later. Controllers can talk to the spacecraft for only a few hours per day, so it's also possible that moving the spacecraft may take several days, Cowing said. Right now, the team is scheduled to use the DSN on June 18 and June 22. After the spacecraft's scheduled moving day (or days), more travel time is planned on July 3, 4 and 6. NASA has given approval so far for the ISEE-3 Reboot Project to speak to the spacecraft until June 25, but Cowing said he has every confidence the window will be extended. Then, when the spacecraft is ready, he has some big plans for outreach — including a website where people can get near-real-time information on how the spacecraft is performing. "We will have an online presence on the spacecraft that rivals NASA's" or is even better, Cowing said, adding he will announce partners on the project when the time is right.